According to Target Marketing’s 2017 Media Usage Survey, email is the most popular marketing channel for customer acquisition, with 84% of respondents stating they use email in this way. Surprisingly, only 25% of respondents stated that email is the marketing method that delivers the strongest ROI for customer acquisition. Which, in my mind, is a great reminder that “most popular” does not necessarily mean “best,” and it’s a good idea to include multiple tactics in your marketing plan. Create a research-based campaign. 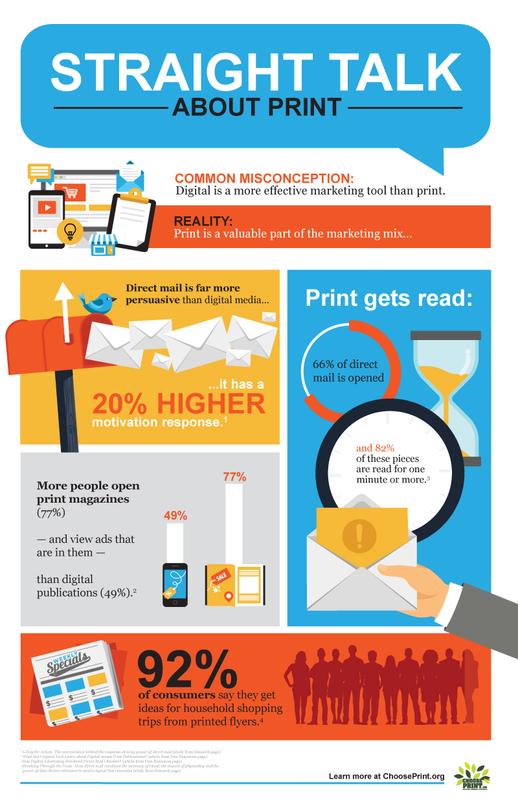 For example, we recently created a series of infographics for the Choose Print campaign (including this one) that use footnoted statistics to dispel common misconceptions about the value of including print in the marketing mix. Have an excuse to reach out. I could also make use of that same survey by sending a personalized email to people with whom I want to keep in touch with a link to the study and a brief overview of why it would be of interest to them. Back up a point you want to make. While a survey on church giving is not the focus of this article about tithing that I wrote for Church Capital Corp, it is used to back up point number 14. Write interesting blog posts. Blog about the key findings, provide an opinion about what it means for your industry, discuss ways readers could use the research results in their own lives, translate a complex report into layman’s terms (like I helped the Kids with Food Allergies Foundation do in this blog), and more. Surveys, research studies and their associated statistics can provide credible third party validation for your marketing message, and fresh ideas for your content marketing efforts. When a great study comes out, make the most of it!